You installed your Google Analytics tracking code, but ... now what? Never fear if the dashboard appears intimidating: It's easier to understand than it looks. Let's go over the basics of Google Analytics and get you on the right track for success. When you go to your dashboard, you'll see a menu on the left side. Clicking on a section will open or close a sub-menu of more specific things you can view. Google Analytics gathers a LOT of data for you, and organizes everything to help you find exactly what you're looking for. All of these areas are useful, but for the sake of simplicity, we'll focus on the big four: Real-Time, Audience, Acquisition, and Behavior. Overview gives you a quick glance at the data you'd find under the more specific categories. 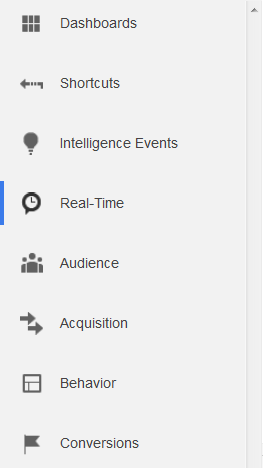 If you want more in-depth information about that data, click on the category from the menu. You will also find your sessions per day here. Sessions track an individual user's experience. So in other words, you'll see how many people visited your website that day, how long they visited, the number of pageviews, which percentage were new users, their demographics and system information, and your bounce rate. A single user can have multiple sessions on your website, with a new session being counted after 30 minutes of inactivity. The Bounce Rate indicates the percentage of people who visited a page but never interacted or clicked to another page. There are numerous reasons users may only view one page. Maybe it wasn't what they were looking for — or perhaps it was, and they got everything they needed from that page alone. It's also possible your site's design doesn't make it clear what they should do next or why. Demographics is where you'll find age and gender statistics about your visitors. Related to demographics, Interests identifies what your visitors are interested in and how it relates to your site. You can view engagement for each interest, age group, and gender; this helps you determine who your site appeals to, where to focus your efforts, and where there's room for growth. Geo (geography) indicates where your visitors are located globally and what language they speak. Under location you can use the map to see how you're doing by country, state or city. Behavior displays which sessions are new users or returning, the frequency they visit and how often, and the length (time) and depth (page views) of their engagement. Don't confuse this with the main menu option with the same name — we'll get to that one later. Mobile shows you what devices users are using to view your website by type, and more specifically (“Devices”) by model, brand, ISP, operating system and screen resolution. Benchmarking compares your data with that of websites listed in the same category. Get a glimpse of how your session data competes, including the location and devices of those sessions. Users Flow shows you the pages users start on, where they go next, and at what pages they “drop off." Do you think users from different countries are behaving differently on your site? What about those directed to your site from social media, or who are using a mobile device? This is where you can find out! These charts visually show you the path a user on your site takes from page to page, and the green dropdown menu lets you change the segment you're looking at. Now that you know what's what in Audience, let's move on to Acquisition. This section will tell you where users are coming from. “Direct” means they typed your site URL in directly (or came from a bookmark). “Referral” means they clicked a link from another site which took them to you. “Social” refers to users who clicked a link on a social media site. Lastly “Organic Search” shows the number of people who found you through a search engine. This data is quickly available in Overview, but All Traffic will take you more in-depth with that information. You can find queries people used to find your site under Search Engine Optimization, but note that you will need to identify yourself as the owner and link the site to your account first (Google will prompt you through this). Social provides detailed data about which social media sites are linking to you. Behavior is next. At first glance, the overview seems the same as what you've already seen, but don't ignore this section just yet: This section helps you track the performance of your individual site pages. Behavior Flow is similar to Users Flow, but it's less about the user's perspective. Instead, it starts on the landing page (first pages viewed) and follows the trail from there. Is one of your pages doing a better job and engaging users than others? Site Content helps you find your top-performing pages, as well as your weakest. Discover which pages attract the most visitors or have the best engagement, and which ones are doing poorly or causing users to leave. Site Speed tells you how fast your pages are loading, and provides suggestions from Google to improve your performance. In-Page Analytics will take you to your site and put nice little percentages over your links. Could seeing what links are working best be any easier? I skipped a few menu options because they're more relevant to users using AdSense, and those who feel comfortable getting more advanced with their analytics. Keep things simple to start! If you want to learn more, I recommend checking out Google's help center, or their videos. Last, but not least, let's get back to the initial option I skipped: Real-Time. Now that you're a master of understanding analytic terms and data, this will be a breeze to grasp. This option shows you a lot of the same information we've covered, but displays it only for users browsing your site in real-time. As in, at this very moment. Awesome, right? But remember: No active users means no data! It's also important to note that Google does NOT track all of these things as default. Some, like demographics and SEO, need to be enabled first. To do so, just click through each category and check for Google prompts to start tracking that information. It's as simple as a click of a button, so don't forget to do it. Now that you understand what these primary options are showing you, knowing what to do next is about to get way easier. Don't worry if you're still unsure; I'll cover what to do with this data in a future post. In the meantime, feel free to ask questions in the comments. Laura is a former madison/miles media team member.